Leveling elements are used to provide a level, stable base for machinery or equipment made up of T Slots. These leveling foot mounts limits tipping, vibration, wear and noise. 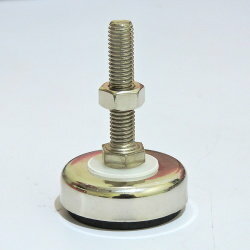 These stainless steel leveling mounts are available in various threaded sizes with pads of diff diameters.